Warning! This is quite possibly the best, most decadent, delicious and amazing food item I’ve ever created. It is over-the-top rich. I have convinced myself that if I only eat it once a year or so, I don’t have to feel guilty about it. Sort of. I’m already dreaming of when I can make this again. It was heavenly. 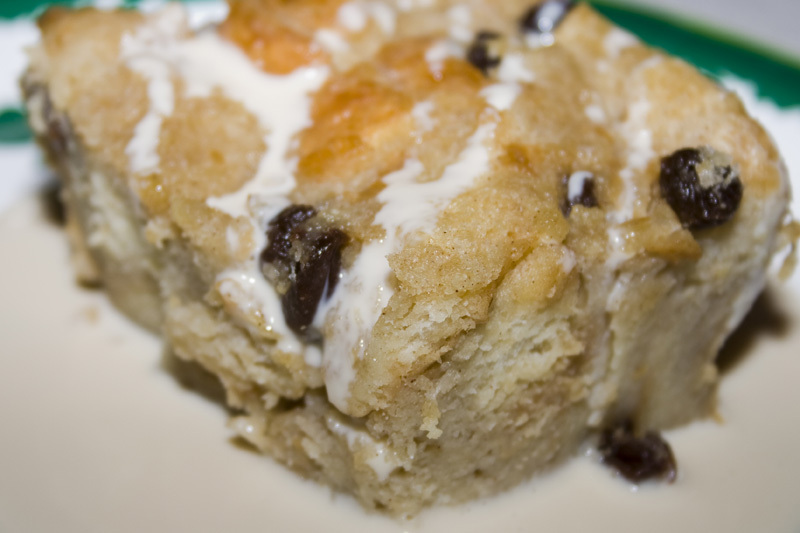 Here’s the thing about bread pudding. It’s bread. Lots of bread. Soaking with cream and sugar. And butter. Then served with a cream sauce. 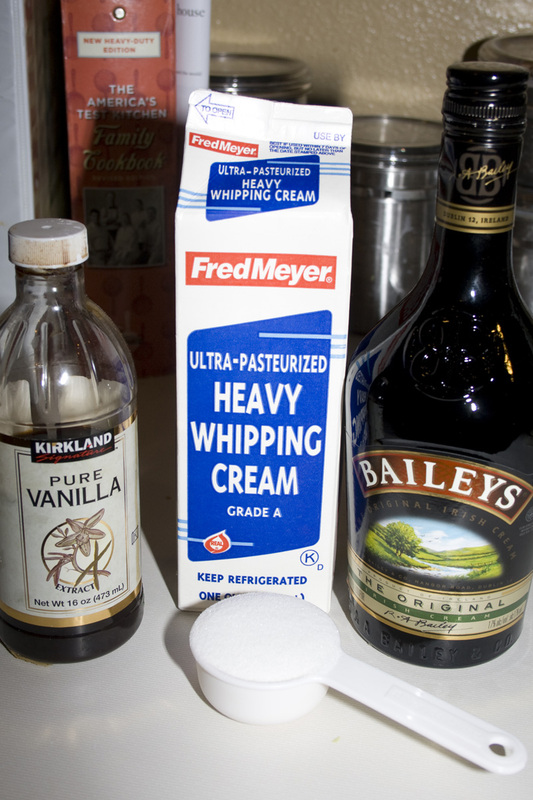 And, in this case – that cream sauce is drunken with Bailey’s Irish Cream Liqour. Absolutely NOT a diet food. But worth every single incredible calorie. 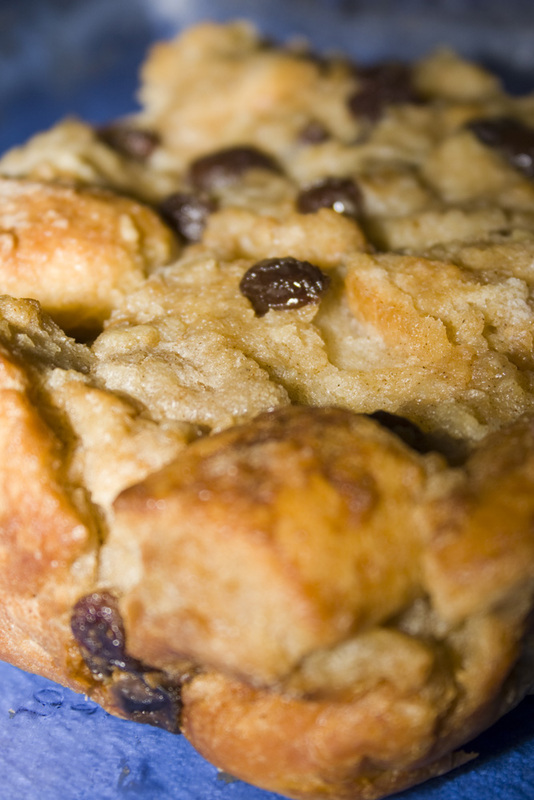 As fancy as bread pudding seems, it’s really easy to throw together. Takes some time, but most of that it’s just sitting there drinking up the delicious creamy goodness or baking in the oven. The time you actually have to spend on creating it is minimal. Start with a loaf of good french bread. If it’s a few days old and a little crusty that’s ok. This is a great way to use up bread actually. 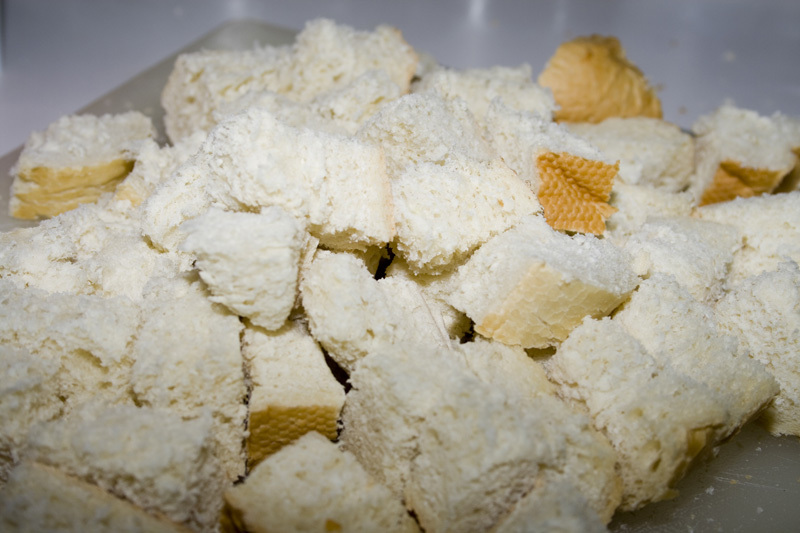 Cut it into cubes and put it in a big bowl. Then we’re going to make a rich sauce for all that bread. With some of the best stuff on earth. Cream, milk, eggs, sugar, vanilla & cinnamon. The butter we’ll get to later. Beat it all up until it’s combined. 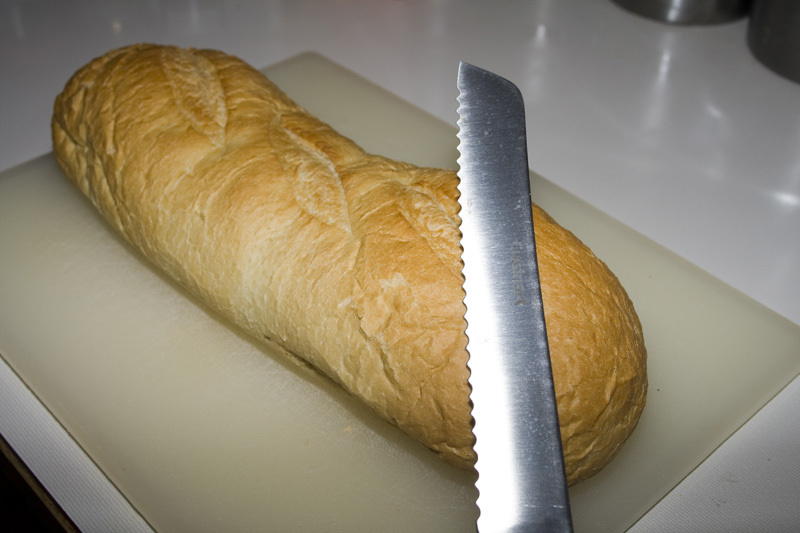 Then pour it over your bread. Push down the bread so it’s all covered in saucy goodness. And let it hang out covered for 30 minutes. Mmmm. Drenched bread. After you’ve let the bread soak up all the liquid, stir in some raisins. Then we’re going to butter a baking dish. I suppose you could do a baking spray, but the butter is going to give you a gorgeous crisp golden crust all around the edges of your pudding. Dump all your bready goodness into the pan and smoosh it down. 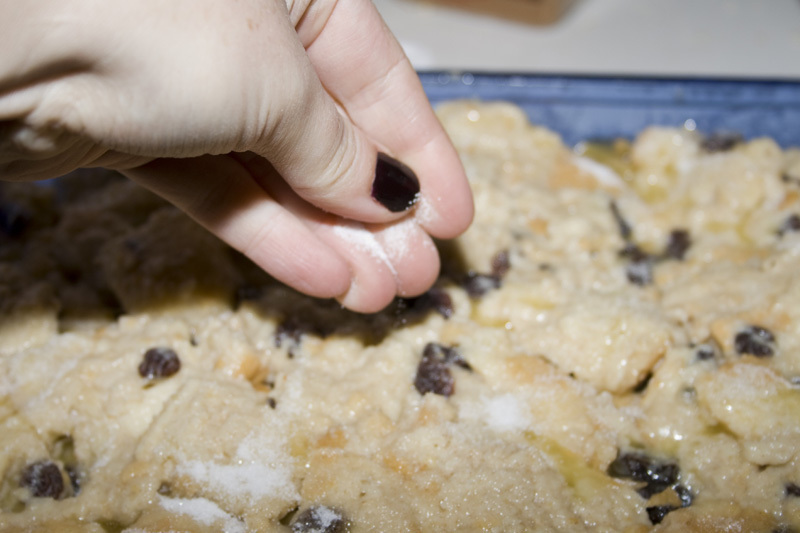 Then top with a sprinkle of sugar for a nice sweet crunch on top. And a little drizzle of cream and (gasp!) some more butter. Just a drizzle. I told you this was not diet food. Bake until it’s puffed, golden and set in the middle – about an hour. So gorgeous! But we’re not done! Still need to make that Bailey’s Custard. I wanted to just pour this into my mouth. It was amazing. More cream, sugar and some Bailey’s Irish Cream start us off. Bring to a boil. 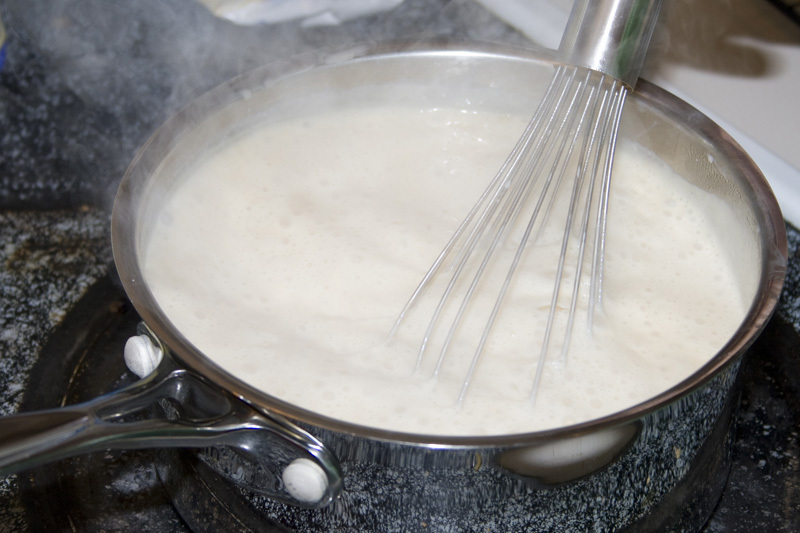 Add a little cornstarch/water mixture to thicken things up and then whisk while boiling for a few minutes (this is the “hardest” part of the recipe). 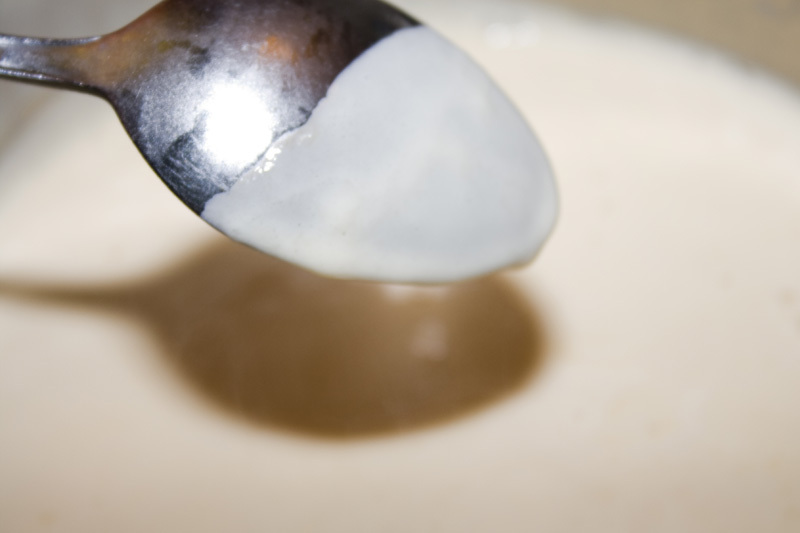 When the custard coats the back of a spoon, it’s done. Put it in the fridge to cool. I always press some plastic wrap down onto the top so it doesn’t develop a film as it cools off. Now, we eat! Scoop yourself out a hunk of cream soaked sweet indulgent bread and drizzle some drunken custard on top. You’ll notice I made a little custard bed for my pudding. The plate seemed so lonely. Seriously. This stuff is unbelievable.Yes. 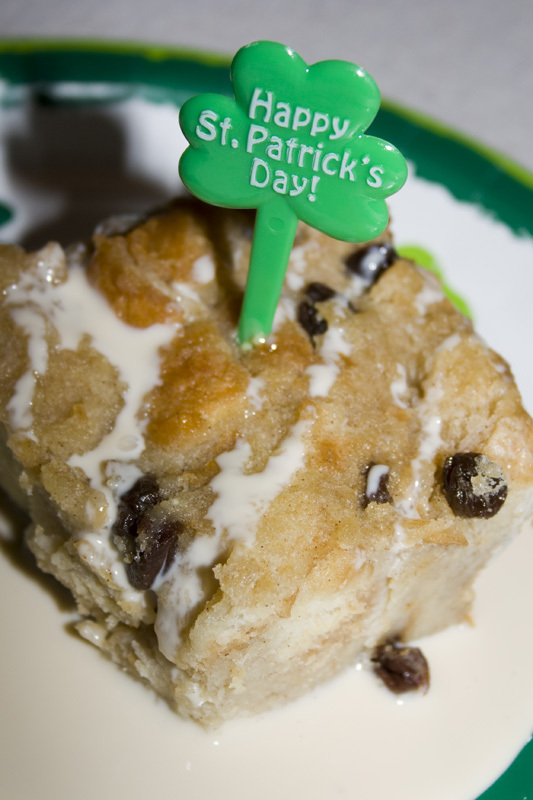 We had it for St. Patrick’s Day (it’s my English/Irish grandmother’s favorite). Yes, you can make it all 364 other days of the year. I give you my (Irish) blessing. 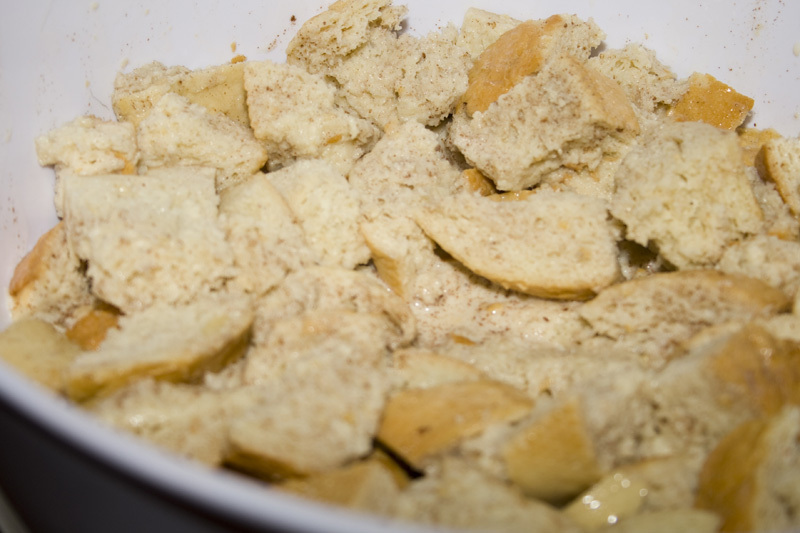 Cut up bread and place in a large bowl. 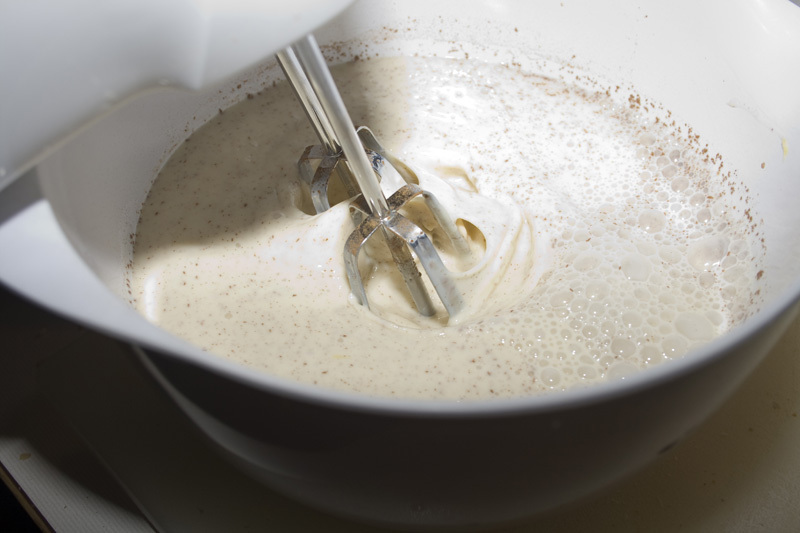 Using electric mixer, beat eggs, 3/4 cup of sugar, cinnamon and vanilla in another large bowl to blend. 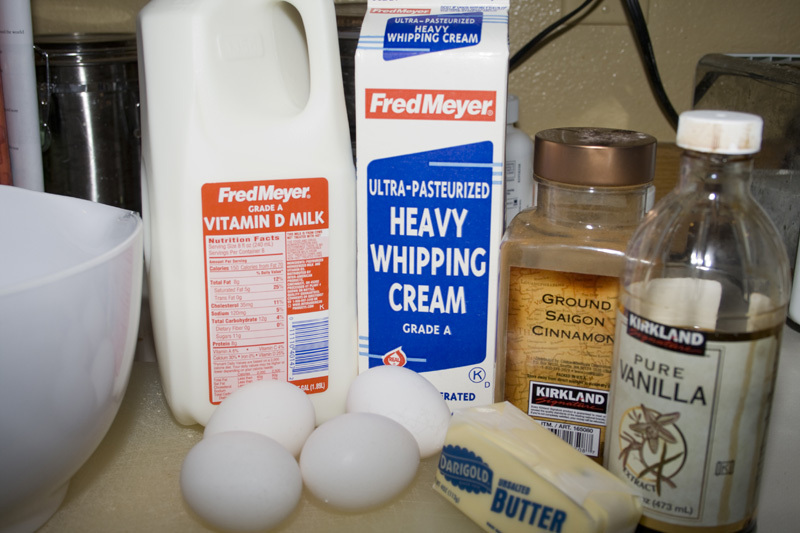 Gradually beat in cream and milk. 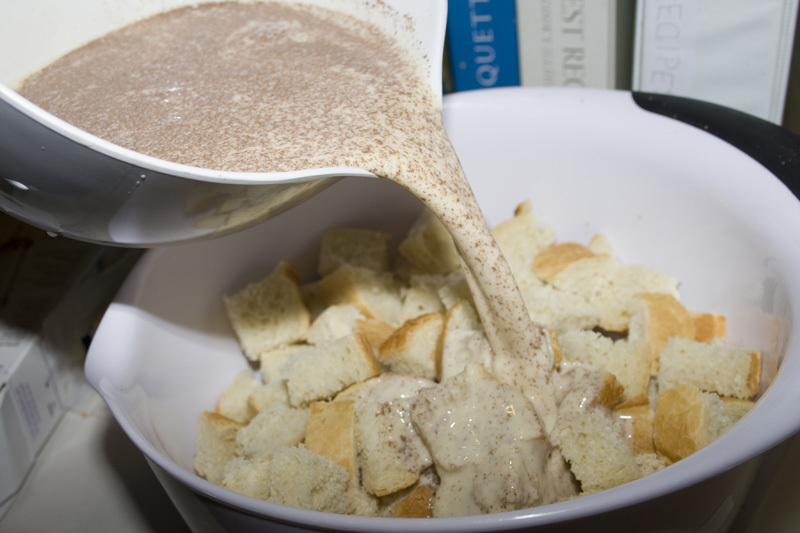 Add cream mixture to bread mixture; stir to combine. Cover with plastic wrap and let stand 30 minutes. Preheat oven to 350°F. 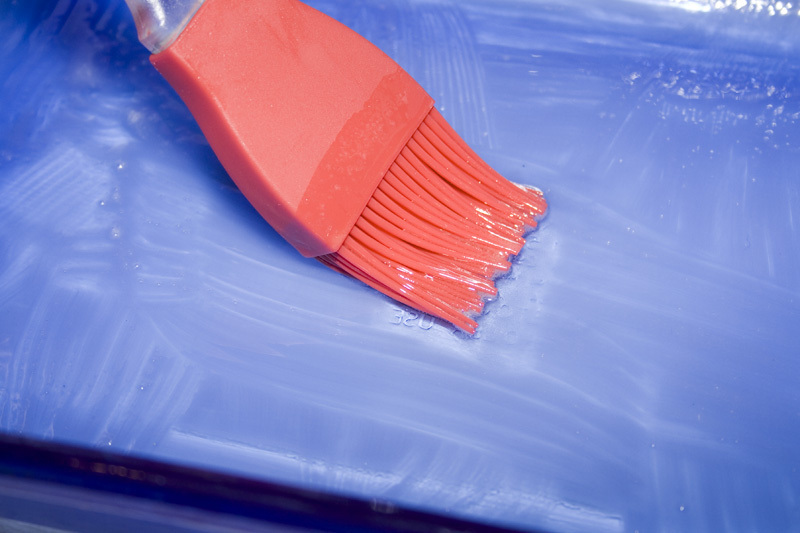 Brush 13x9x2-inch glass baking dish with melted butter. 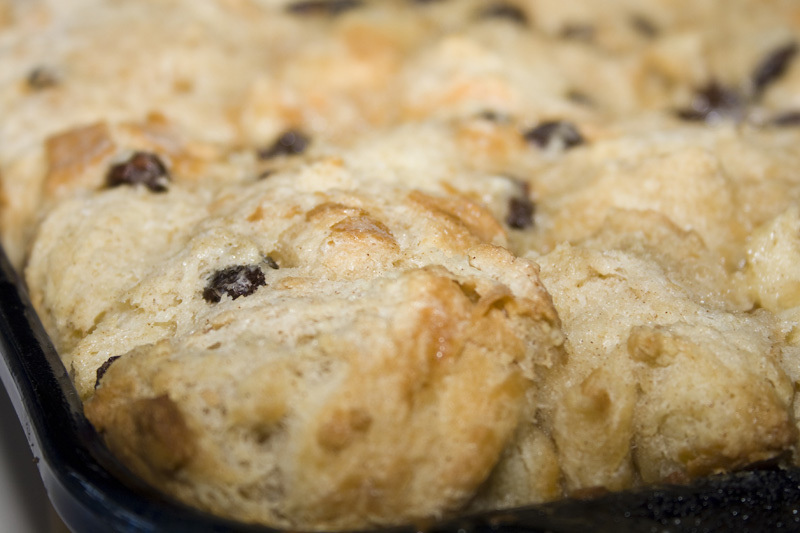 Stir 1/2 cup raisins into bread mixture and transfer to prepared dish, spreading evenly. Drizzle with remaining 2 tablespoons of cream. Sprinkle with remaining 2 tablespoons sugar. Drizzle with any remaining melted butter. Bake pudding until edges are golden and custard is set in center, about 1 hour. Cool pudding slightly. Any chance I could assemble this dish the day before Easter and then just cook it on Easter ? Certainly! Assemble the night before, cover tightly and pop it in the fridge. I would maybe drizzle a bit more cream on top in the morning before baking (just to be sure it doesn’t dry out). Should work just fine. Hi Tonya! 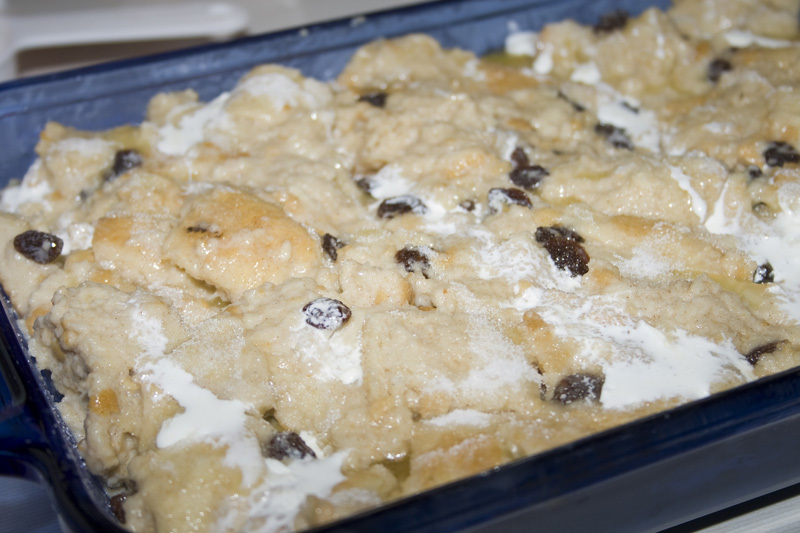 I made your bread pudding for a belated St. Patrick’s party last night (Wallace-style 😉 It was delicious and quite easy to make. Adults and kids all loved it – the pan was scraped clean by my guests! I thought I would share another St. Patrick’s favorite of mine – Chocolate Guiness Goodness. http://www.epicurious.com/recipes/food/views/chocolate-guinness-goodness-234304 I usually divide into smaller 1 cup or smaller jars/glasses. Hope you get the chance to try it sometime. Sending you blessings and lots of creative cooking energy! I’m so glad you enjoyed the bread pudding! What fun to have a Wallace style St. Patrick’s Day event! Thanks for sharing your Guiness Goodness recipe. That looks awesome! So nice to hear from you!